PRASADI ACADEMY: Prasadi Academy�Known as one of the best high school in Nepal which is established in 1997 located at Manbhawan, Lalitpur. With almost 98.73% approximately pass percentage of students who graduate from that high school. Prasadhi has three faculty stream that a student can study which is Management and Science. It emphasizes on both academics and extra curriculum and the admission fees are Rs 14,950 and monthly fee is RS3050 and Rs4050 respectively. BUDHANILKANTHA SCHOOL:�Budhanilkantha is one of the oldest school established in Nepal which is located in the capital of the country. It was established in 1972 as a joint venture between government of Nepal and government of United Kingdom. It is a fully residential English medium co-educational public school that runs from grade 5 to grade 12 that promises quality education with no discrimination in equality and unity. Even it is one of the oldest school in Nepal it still got it’s perfect harmony between vintage and modern buildings and architecture that covers about 29hectrs of land with has excellent physical facilities of a A+ grade residential school. Students all over the country that represents different races, ethnicities, cultures and socio-economic levels. Scholarships system is available for about one third of the total student population to the meritorious and needy student under the government’s scholarship. Not just that it also excellence students in leadership and co-curriculum activities and gives equal importance to both physical and academic education. XAVIER’S ACADEMY:�Established in 1997, located in Lazimpat under NEF management. In terms of academics, facilities, faculty, programs offered and infrastructure it has always constantly been in top 10 highschools in Nepal.� They provide two faculties Science and Humanities with admission fees of Rs14,000 for both and monthly field as Rs5000 and Rs4000 respectively. SAINIK AWASIYA HIGHER SECONDARY SCHOOL:�Established with the joint investment of the Nepali Army and Tribhuwan University at Bhimpbedi of Makawanpur district on the 14th Poush 2035. They provide three faculties Science, Management and Humanities. For 20 years it has provided the excellent quality education with enlisting students who are board toppers. With excellent teachers teaching there and amazing facilities available in the school. 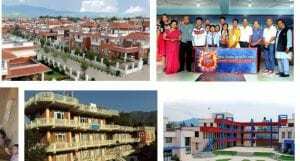 S.NIKETAN HIGHER SECONDARY SCHOOL:�Two times awarded �The best School of Nepal� located in Kathmandu with 4000 over students and amazing results every year. Established in 1981, by founder Principal B.R. Pokharel. This institution runs from grade nursery to grade 12 that accommodates Lower-secondary level SLC and Higher-Secondary level HSEB qualifications to the students and guides its alumni to the college education. It has a good architecture with amazing facilities such as cafeteria, transportation, hostel, a good size class room, both indoor and outdoor games for student and excellent study environment with top notch teachers to guide the students. KUHS(KATHMANDU UNIVERSITY HIGH SCHOOL):�This school is located in the most beautiful breathtaking location in Dhulikhel. A non-profit school owned and operated by Kathmandu University which was founded and established in 1998 under Kathmandu University Preparatory School. The school runs from grade 1 to grade 12 and also has A-level program that is under University of Cambridge International Examination. They claim to have different variant of efficiently teaching methodologies which is stimulating and interactive. BHANU BHAKTA MEMORIAL HIGHER:�Established in 1966, a tribute to one of the greatest renowned figure of Nepali literature, Bhanubhakta Acharya. This is a co-educational English medium school that runs from nursery to class 12. This school follows modern method of teaching that including smart class and CCTV cameras. They also have an excellent facilities such as boy’s hostel, science laboratory for practical classes, three computer labs, judo hall, multipurpose Astrid Hall, Music hall and Smart Class hall. It is known as one of the biggest private schools of Nepal with over 2200 studens and nearly 150 teachers who provides both educational and physical education and facilities. GYANODAYA BAL BATIKA:�Established in 24 February, 1975 on tribute to late Majesty Birendra Bir Bikram Shah which is now also known as Education Day in Nepal. This school runs from grade 1 to 12, with exceptional quality of education and facility. It is divided into three division. Residential facility is also available in Gyanodaya for students inside or outside the Kathmandu valley. Students over 350 studies in this residential school that is located in Bungamati, Khokana with amazing facilities available to the student playgrounds, auditorium, IT access, audio-visual aids, science laboratory and a library. It has a team to attend to the health needs of the hostel inmates. The higher secondary school is located in Sanepa where they teach three main stream Science, Humanities and Managements. Lastly, there is Gyanodaya College that teaches BBS (bachelor level) that is affiliated with Tribhuwan University.